In 1884 when Calgary was no more than a dot on the Bow River the Calgary Agricultural Society was formed. Two years later their first exhibition was held. 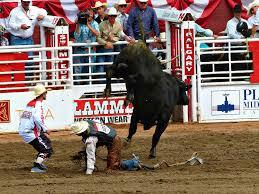 This grew and by 1912 an experience that has since become known as the Calgary Stampede was fully functioning. Each year at the same time of the Stampede the city of Calgary, which during the rest of the year is the hub of the oil, ranching and farming business of Alberta, parties like no other city in the world. The Stampede, which claims to be the world’s largest and greatest outdoor show, is full of parades, rodeo and chuck wagon racing and nightly musical extravaganzas. The musical extravaganza culminates with a spectacular firework display, which truly adds to the whole “Stampede” experience. And there is more - The Stampede grounds also host a major agricultural show and a giant midway show (that’s American for fun fair). If you are interested in music, there is some great live music in the showground including Nashville North, that during the Stampede period hosts some of the top Country & Western artists from across America.